This Blueberry Panna Cotta is rich, creamy and decadent and the perfect way to finish off a meal with a little stylish decadence. This delightful blueberry panna cotta is subtly flavoured with vanilla seeds and accompanied by a mouth watering fresh blueberry sauce. It is surprisingly simple to make, the trickiest part being removing it intact from the mould! 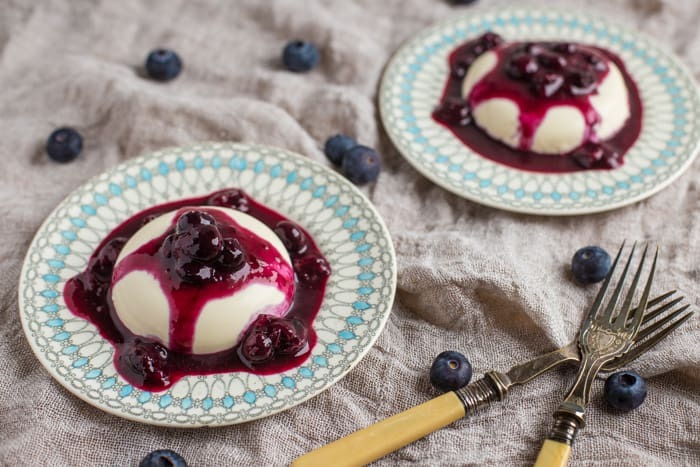 Today’s yummy Blueberry Panna Cotta recipe is brought to you in association with a2 Milk™. 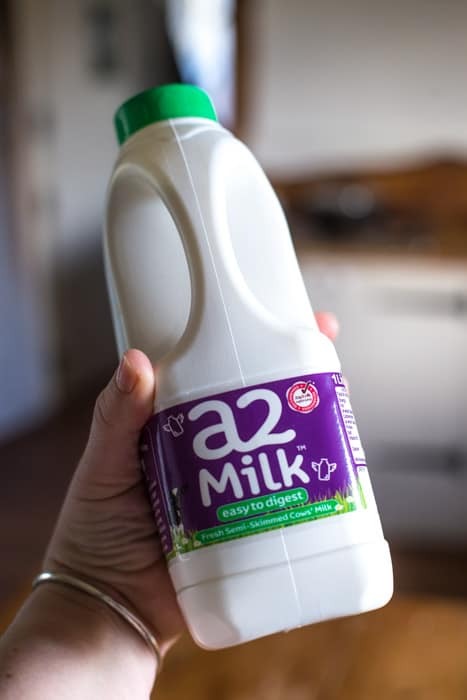 For those of you not in the know, a2 Milk™ is an easy to digest cows’ milk that may help those with lactose intolerance (LI) or other gastro intestinal disorders consume dairy products with no ill effect. There’s nothing new about a2 Milk™, in fact this is the type of milk that our ancestors would have drunk. Think of it as old fashioned, all natural milk from cows that traditionally produce the A2 protein. According to the same article, even those that don’t consider themselves to be LI showed less gut inflammation at a microscopic level after switching over to a2 Milk™. In the interest of disclosure I tried a2 Milk™ late last year. I started getting gastric symptoms as a teenager, but only realised it was lactose intolerance about 7 or 8 years ago. I haven’t drunk cows’ milk or consumed other dairy products ever since. However I can eat small amounts of butter, traditionally matured hard cheeses along with goat, sheep & buffalo milk products with no ill effects. To trial a2 Milk™ I ate a bowl of cereal once a day for 4 days and made note of any symptoms. Day 1 and 2 I had zero symptoms (which was a huge surprise!) Day 3 wasn’t quite so good but the symptoms weren’t particularly bad. By day 4 I had the typical gastric response that I would have expected on day 1. So whilst my results weren’t entirely positive, I would still urge any of you that have confirmed or suspected LI to give a2 Milk™ a go. Imagine a world where you can drink the same milk as your family – what a novelty that would be! Set the gelatine leaves to soak in cold water. Pour the milk, cream and the vanilla seeds and pod into a saucepan. Bring to a simmer then take the pan off the heat. Squeeze all of the water out of the gelatine leaves and add them to the milk pan and stir until thy have dissolved into the milk. Pour between 4 ramekins, tea cups or other small bowls and let cool before popping in the fridge for a minimum of an hour to set firm. To remove the panna cotta from the mould, submerge the ramekin in a bowl of warm water for 1-2 minutes. Dry the bottom then place a plate over the top and flip. Repeat until the pudding plops out onto the plate. Pop all the ingredients into a small pan. Using a potato masher or fork, crush around half of the blueberries. Simmer very gently until they release their juices, and then become syrupy. Let cool before topping each panna cotta with a generous spoonful. Huge thanks to a2 Milk™ for sponsoring this content and allowing me to continue bringing you yummy recipes, for free. As always all thoughts (and leftovers!) are my own. I’ve always wanted to try this milk so thanks for reminding me. This recipe looks fab btw! Thanks Becky! Do let me know how you get on with the milk, the people that respond well to it swear by it. 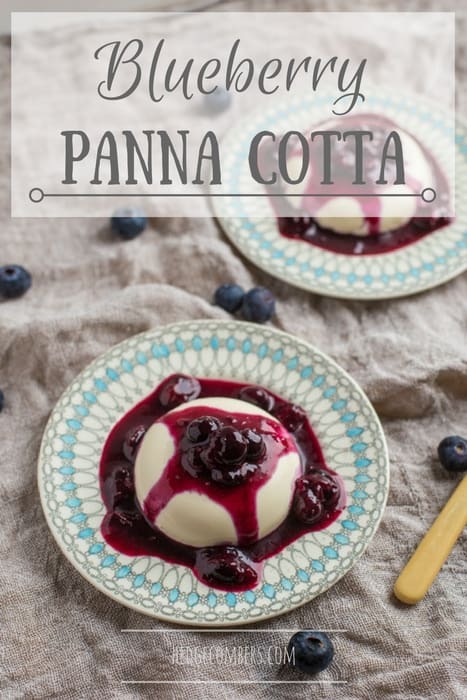 Who doesn’t love panna cotta…seriously! But the addition of that blueberry topping makes this just perfect for spring! Yum!! I haven’t tried a2 milk. This dish looks yummy! Panna cotta is delicious especially with fruit topping. This milk sounds great if it allows people with an intolerance to try a milk dessert again. Agreed Claire, I hope lots of folk that cana;t toerate dairy go out and try it, and get positive results! Panna cotta is one of my favourite things in the entire world! It looks so smooth and creamy. And we love a2 milk in our house!